I visited 那須 (Nasu, Japan) for the first time on 21-22 February 2006 to relax in the mountains with めぐみ (Megumi). The omnipresent snow created a special atmosphere, both calming and providing a feeling of remote exploration. 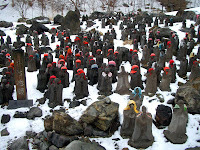 I was very surprised and moved by an endless field of statues of 地蔵 (Jizo) because I had never seen such a thing and because these statues were each provided to pray for the death of a young child.